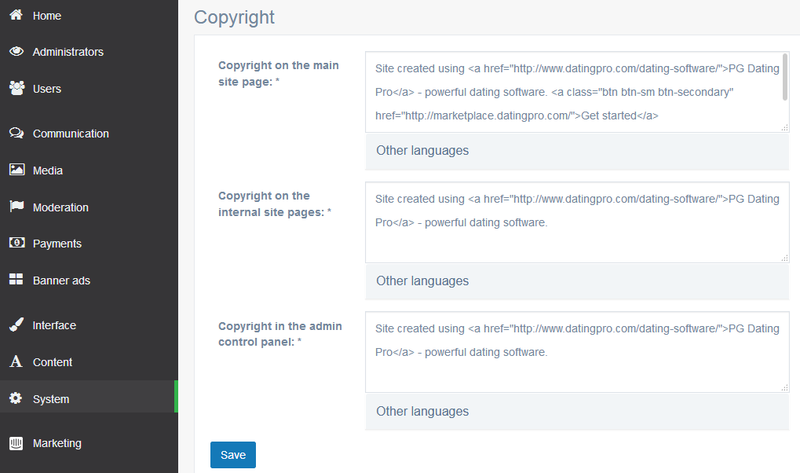 Home › Academy › Help & FAQs › How to change copyright on my dating website? Copyright is a text at the bottom of the site. It contains the information about intellectual property rights and is a very important part of creating your site brand. Our company provides you with an opportunity to place your own copyright at the bottom of your site. This is how you can do that. 1. Connect to your site files by FTP. 2. To change the copyright for the user interface of the site, go to file /application/views/flatty/footer.twig. 3. To change the copyright for the administration panel of the site, go to /application/views/admin/footer.tpl. 4. Replace existing copyright info with your own copyright info (highlighted in bold below). 2. If the changes do not take effect immediately, try deleting temporary .php files from directories /temp/templates_c and /temp/twig/compiled. Warning: Do not delete any other files (.html, .htaccess) from these directories. 3. If you have downloaded and installed a free open source copy of the script, we can remove our copyright for a $49 fee. Please review this service in the Dating Pro Marketplace.